Picking up where The Simpsons: A Complete Guide to our Favorite Family left off, The Simpsons Forever! brings all the history, tidbits, and cold hard facts on every episode from the past two years, and much, much more. Fans will find the highlights of all the shows from seasons nine and ten, plus eyeball–busting two–page spreads for special episodes (like the annual Halloween show). Heavily packed into these pages are updated favourites like Best Homerisms, Famous Chalkboard Sayings, All–New Simpsons Singalong Lyrics, Couch Gags, and classic screen images. And, yes – it’s all cross-referenced! 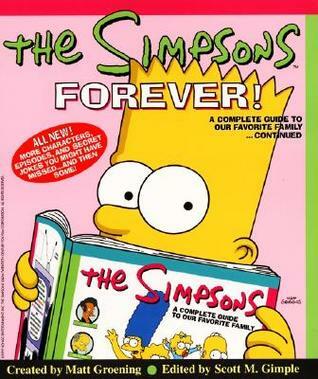 This book is the second as part of a series released by Matt Groening that start at season one and work through the series aired at the time up until season 14. Each book is a continuation of the previous publication with multiple seasons covered within. This is important because anyone who reads this book, especially thinking they are getting a full series exploration, will no doubt be disappointed. While the first book covered seasons 1-8, this second one is very short, covering only seasons 9 and 10 but it still is filled with detail. Each episode overview for both seasons includes quotes, blink and you miss it things you may have missed, as well as fun information about background characters, songs, show highlights, character bios as well as the numerous and varied movie and pop culture references made by the writers and animators. This is a great read if you like the attention to detail that The Simpsons have always had and the clever and creative signs, references and homage, or unique characters that have been created over the years. The trivia is enlightening and I was reminded of things I had long forgotten and even learnt a few things that made me even more in awe of the genius minds of the people who work on the show. I went looking for these books when I learnt of them because I’m a long time fan of The Simpsons. This book is from early on in the shows run, when only 10 seasons had been aired, and nowhere near as comprehensive as the later publication featuring the first 20 seasons, which even now is old given the new 30th season. Having said that, it is still a great read. I think being closer to the airdates there were more things to include, and more focus could be put on each episode without worrying about making anything too long or cluttered. If you are a trivia nut like I am the little random facts are fun to learn and it’s great to read about just how much thought goes into background characters and crowd scenes. Hopefully I can track down the rest of these early books because I think they would be an enlightening read, especially ones that cover more seasons. Oooo! I had the second book when I was younger, I remember loving all the extra tis bits and info. Especially for all the American content I didn’t really understand. Absolutely! I was reading it and it has stuff like ‘This scene was a parody of this movie I’ve never heard of’ and it was really interesting.